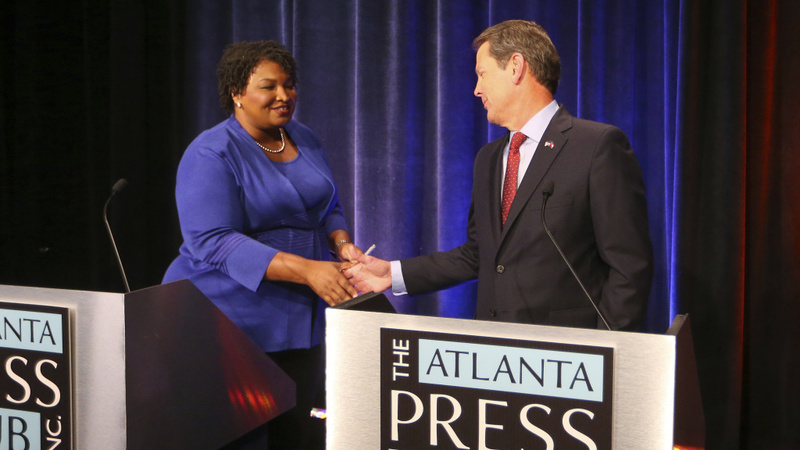 Democrat Stacey Abrams and Republican Brian Kemp greet each other before a debate last month in Atlanta. "I acknowledge that former Secretary of State Brian Kemp will be certified as the victor in the 2018 gubernatorial election," Abrams said. "But to watch an elected official who claims to represent the people in this state baldly pin his hopes for election on suppression of the people's democratic right to vote has been truly appalling." In a fiery speech, Abrams insisted this was no normal concession, decrying the "deliberate and intentional" voter suppression by Kemp that she believed had led to this conclusion. "Pundits and hyperpartisans will hear my words as a rejection of the normal order. You see, I'm supposed to say nice things and accept my fate. They will complain that I should not use this moment to recap what was done wrong or to demand a remedy. 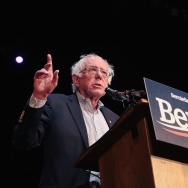 You see, as a leader I should be stoic in my outrage and silent in my rebuke," Abrams said. "But stoicism is a luxury and silence is a weapon for those who would quiet the voices of the people. And I will not concede because the erosion of our democracy is not right." The contest between the two had been one of the most closely watched — and bitter — of the cycle. Abrams, who was vying to become the first black woman ever elected governor in U.S. history, had alleged throughout the campaign that Kemp, who stepped down as secretary of state after the election, had been working to disenfranchise minority voters, deny or delay new registrations and purge voting rolls. "On election night, I declared that our fight to count every vote is not about me — it is about us. It is about the democracy that we share and the responsibility to preserve our way of life," she said Friday. "Voting is not a right for some — it is a right for all, and it is not a privilege," Abrams emphasized, echoing the mindset of African-Americans who fought only decades ago for the right to vote — which was especially suppressed in places in the Deep South, and in Georgia. But with a 5 p.m. Friday deadline for all of Georgia's counties to certify their election results, a path for Abrams was looking slim. It's now up to interim secretary of state Robyn Crittenden to certify the state's results. The Associated Press reported that the Abrams campaign had been considering additional legal challenges, including one before the state Supreme Court that was precipitated on a provision allowing a losing candidate to challenge results based on "misconduct, fraud or irregularities ... sufficient to change or place in doubt the results." Abrams said she is not challenging the result in court, but she announced at her news conference that her campaign "will be filing a major federal lawsuit" against the state of Georgia "for the gross mismanagement of this election." But Abrams also noted that she would "pray for the success of Brian Kemp that he will indeed be a leader of all Georgians." In a statement following Abrams' remarks, Kemp said that he was looking forward to moving beyond the campaign and protracted ballot disputes. "I appreciate her passion, hard work, and commitment to public service," Kemp said of Abrams. "The election is over and hardworking Georgians are ready to move forward. We can no longer dwell on the divisive politics of the past but must focus on Georgia's bright and promising future." Kemp's campaign had long maintained that he would be victorious and was preparing for a transition. It had previously ripped Abrams for her refusal to concede, calling it a "publicity stunt" and "temper tantrum." But Abrams had vowed to press on for nearly two weeks, with her campaign framing it as a much bigger fight for voting rights, especially among minority voters. And ultimately Abrams, the former state House minority leader, came much closer than any Georgia Democrat has in nearly two decades to flipping either the governor's mansion or a Senate seat, despite some other high-profile efforts. With the rapidly diversifying and growing Atlanta suburbs, Democrats have been arguing the state could turn blue, but this is the closest they've gotten to making that dream a reality.